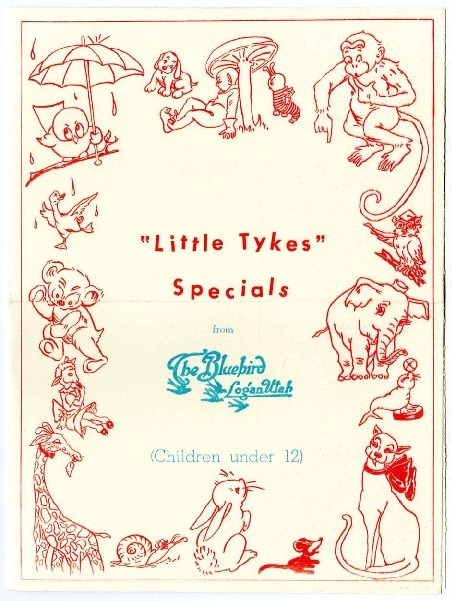 Little Tykes Specials from the Bluebird Cafe in Logan, Utah from 1969. Menu items include bozo (hamburger patty, mashed potato and gravy, bread and butter, vegetable, milk or Orangeade, Ice cream), chicky (drumstick and wing, French fried potato, Orangeade or milk, ice cream) peter rabbit (mashed potato and gravy, vegetable, lettuce, Orangeade or milk, bread and butter, Ice cream), soupy (fruit juice, bowl of Today's soup, salted crackers, milk or Orangeade, ice cream), baa baa (Grilled lamb chop, mashed potato and vegetable, bread and butter, milk or Orangeade, ice cream), and porkie pig (baked ham sandwich, potato chips, slice pickle, milk or Orangeade, ice cream). Includes a Mother's helper check chart. Back reads: "Mothers and Fathers love their children...We must all use our best manners always. If you eat everything up and are nice maybe mother will bring you to the Bluebird next week. 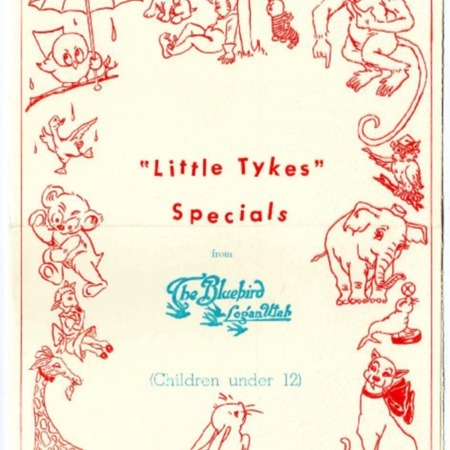 (Take this Menu home and use the chart inside)"
“The Bluebird menu, Little Tykes specials, 1969,” Highway 89, accessed April 22, 2019, http://highway89.org/items/show/10252.